A white hammock and a black metal bed frame occupy much of the space inside The Franklin, a backyard artist-run gallery in East Garfield Park. Like the diagonal plywood cutouts of the gallery’s walls, and the hanging mini blinds there, the hammock’s netting perforates the space. Inside the hammock lays a chrome ashtray, stacked on an oval mirror, stacked on a framed portrait. Alberto Aguilar’s site-specific installation, titled “(In) Between Out,” plays with spatial layering and the personal histories of found objects. 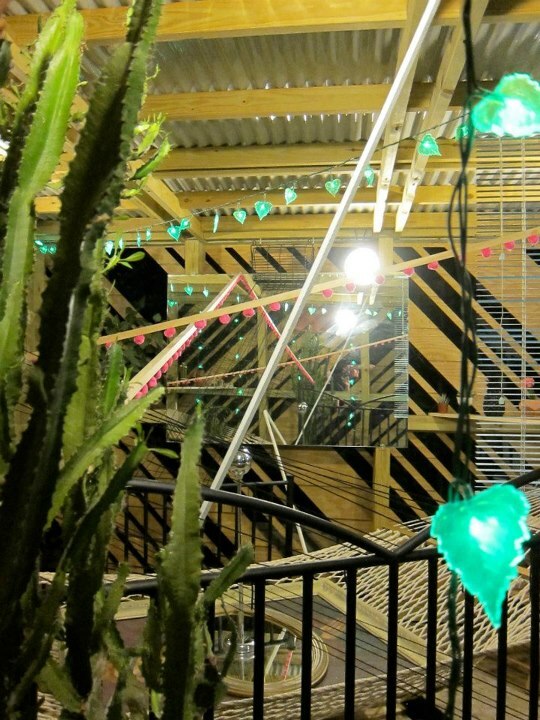 Mirrors, hanging lights, cacti, a wire shopping basket, a black pineapple, and more—some brought to the space by Aguilar and some pulled from the home of the proprietors of The Franklin, whose backyard houses it. A few feet away, an artificial tree in a concrete planter left by The Franklin’s former resident artist, Rafael Vera, further pushes the inside/outside motif, and emphasizes Aguilar’s interest in personal networks, collaboration and play. Each of the many objects in The Franklin are placed purposefully, with great attention to texture, reflection and composition, so that every viewpoint offers an equally mystifying visual experience. Alberto Aguilar shows at The Franklin, 3522 West Franklin, by appointment.